Home / Stock Picks / Hot Stocks / After a Lackluster 2017, Is It Time to Sell Walt Disney Co Stock? 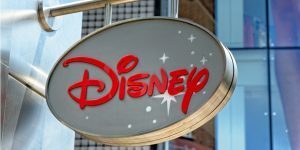 After a Lackluster 2017, Is It Time to Sell Walt Disney Co Stock? Walt Disney Co (NYSE:DIS) has disappointed this year. Walt Disney stock is up only a paltry 0.54% year-to-date, while the Dow Jones Industrial Average, which it is a component of, is up 18.53%. Disney recently reported its fourth quarter and full-year earnings for fiscal 2017, which ended on Sep. 30. Net income decreased 4% this year, and operating income fell by 6%, yet Walt Disney stock is up 12.63% since I wrote about it last October, just before the 2016 election. Problems I mentioned last year, including rising sports-rights costs, cord cutting and the disruption of the cable industry, remain. Cable networks accounted for 36.2% of Disney’s operating income over the past 12 months, so problems in the cable industry mean big trouble for Disney. DIS has gotten a lot of press coverage recently. In August, Disney increased its stake in BAMTech, a company providing streaming services for multiple sports leagues and HBO, from 33% to 75%. Disney plans to use BAMTech’s expertise to create its own movie streaming service by 2019. It will cut out the middleman, removing its movies from Netflix, Inc. (NASDAQ:NFLX) by that time. And last week, CNBC reported that Disney had talked to Twenty-First Century Fox Inc (NASDAQ:FOX, NASDAQ:FOXA) about purchasing its movie studio and networks such as FX and National Geographic. Let’s look at Disney’s different segments and how they performed in fiscal 2017. 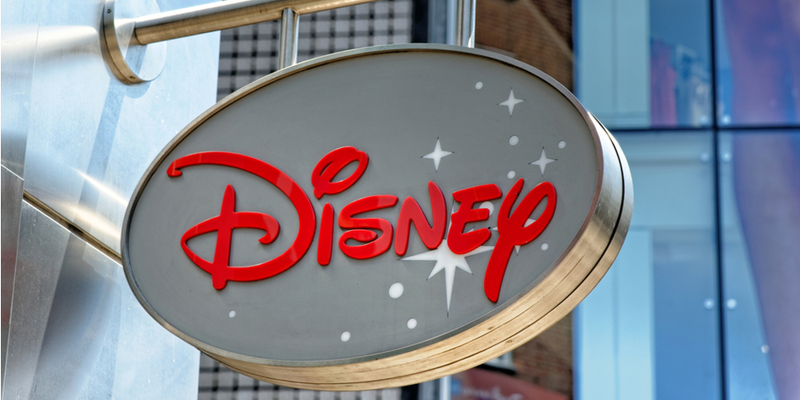 Disney is one of the world’s best-known companies and owns a large portfolio of assets. 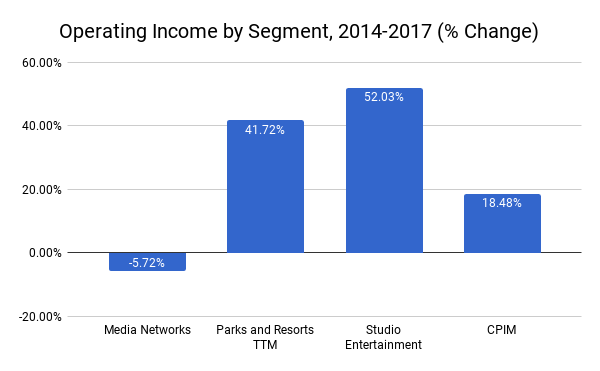 The company reports operating income in four segments: Media Networks, Parks and Resorts, Studio Entertainment, and Consumer Products & Interactive Media. 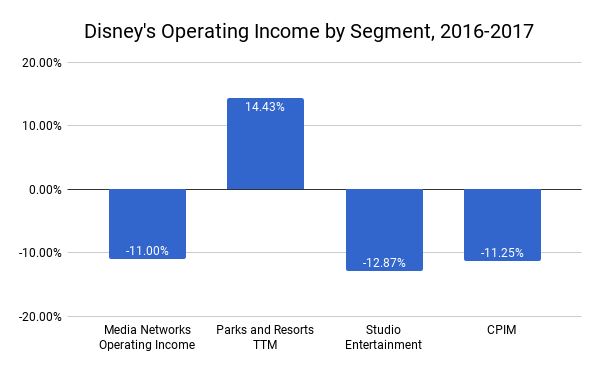 Media Networks accounts for the bulk of Disney’s operating income (46.71%). Disney splits this into both cable and broadcasting assets. Cable includes Disney channels, ESPN and Freeform, which was formerly known as ABC Family. Broadcasting includes ABC, a producer of shows such as Grey’s Anatomy and Modern Family, as well as Jimmy Kimmel Live! Disney’s parks and resorts span the globe. They include Walt Disney World in Florida, Epcot, Disneyland Paris, Tokyo Disney, Shanghai Disney, the Hong Kong Disneyland Resort, as well as the original Disneyland in Anaheim and Disney Cruise Line. Disney’s Studio Entertainment division comprises the Walt Disney Pictures, Pixar, Marvel, Lucasfilm (which it purchased in 2012) and Touchstone studios. This division also includes the Disney Music Group and the Disney Theatrical Group. Finally, the Consumer Products & Interactive Media division includes video games, comic books, action figures and other merchandise. It’s not just cable. The only segment that managed to grow operating income in 2017 was Disney’s Parks and Resorts, which reported a 14.43% increase. Disney notes that 2017 was the first full year for the Shanghai Disney Resort, which opened in June 2016. The other segments experienced double-digit declines. Instead, DIS attributes the trouble for media networks to lower Freeform viewership. As for the remaining two segments, Studio Entertainment and Consumer Products & Interactive Media, Disney blames their poor performance this year on their strong performance last year with Star Wars. According to Box Office Mojo, The Star Wars movie The Force Awakens, released in December 2015, grossed almost twice as much as Rogue One, released in December 2016. Although Studio Entertainment and Consumer Products & Interactive Media posted declines in 2017, they have grown at a good pace since 2014. Studio Entertainment actually grew the fastest, up 52% since fiscal 2014. Only Media Networks shrunk over the past three years. Operating income from cable fell 17.23%, while broadcasting grew 41.1%. Last year, operating income from cable shrunk 10%, while broadcasting managed a 1% gain. 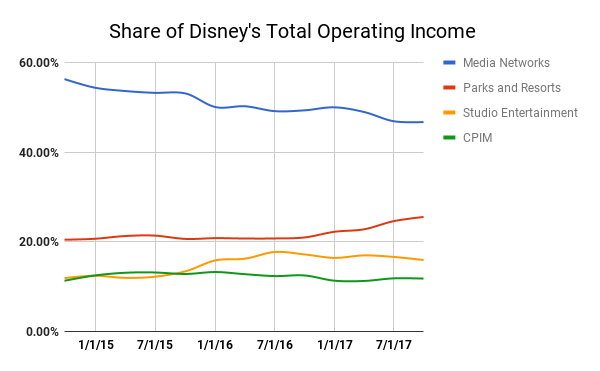 Because of its poor performance, Media Networks accounts for a declining share of Disney’s income. While cable will probably remain a problem, Walt Disney stock’s other divisions have grown in recent years, and that’s a good sign. Article printed from InvestorPlace Media, https://investorplace.com/2017/11/walt-disney-is-it-time-to-sell/.